The loss of captain Mark Lynch to injury only added to a disappointing afternoon for Derry in Galway. Derry’s Championship season was brought to a controversial close as they slipped to a disappointing six point defeat against Galway in Pearse Stadium, Salthill on Saturday evening. Not for the first time this season, Brian McIver’s men struggled with the transition from defence to attack but their prospects were not helped by the performance of Cork referee, Conor Lane, who black carded both Brendan Rogers and Danny Heavron, the first for a completely innocuous first half clash. Played in atrocious conditions, the game hinged on a 60 seconds period with 10 minutes to go. With Derry trailing by four, Cailean O’Boyle claimed to have been shoved to the floor as he attempted to fist Eoin Bradley’s centre into an empty net. The referee waved away all appeals and O’Boyle looked to have made the most of any contact but within seconds the ball was in the Derry net at the other end. Galway swept down the pitch while Derry complained with a flowing moved ending with Danny Cummins, who also received a late black card, swapping passes with Liam Silke before firing Derry out of the Championship with an emphatic finish. The visitors never recovered but more frustrating than the goal was the constant stream of soft frees which were awarded to the home team and which will only add to Brain McIver’s disappointment. Bradley got the scoreboard working in the second minute with a fantastic point from the left hand side after a free had been worked short to him. That lead was doubled three minutes later through a Benny Heron free after Seanrd Leo McGoldrick had been upended by Fiontán Ó Curraoin. The Oak Leafers continued to dominate the early stages and could have grabbed a goal on eight minutes when a superb moved, instigated by Danny Heavron, saw the ball moved through Bradley and Fergal Doherty before being retuned to Heavron who was forced to shoot high over the bar under pressure. The home side finally got off the mark in the 10th through a Gary Sice free but the visitors’ back line was well on top in the first quarter with Dermot McBride doing a fine job on Galway dangerman Damien Comer. O’Boyle saw another snapshot blocked close to the Galway goal before Oisin Duffy was penalised for a foul on Cummins allowing another Sice free to bring the game back to a single point game on 15 minutes. The game was level as the tide began to turn on 18 minutes when Comer forced Holly into a cul-de-sac from which the Galway man was able to engineer a free. It became a scorable free when Holly protested and the ball was moved forward with Paul Conroy registering the home side’s third free of the half. With Galway trying to pen Derry in, Thomas Mallon was struggling to get any distance on his kicks into an ever increasing wind. It allowed Galway to advance further up the field. It was putting pressure on the Derry defence and what had been a disciplined opening began to unravel with Sice the chief benefactor through a succession of frees which put the home team into a 0-6 to 0-3 lead by the 25th minutes. A bad situation was made worse with a very harsh black card for Brendan Rogers who was adjudged to have committed a third man tackle on Galway corner-back Johnny Duane when it looked like the Slaughtneil man merely slipped. 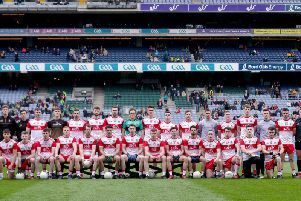 the sense of Derry injustice was growing and it only increased seconds later when Paul Conroy fried over his side’s seventh free of the half to leave them four points to the good but still without a score from play. McIver’s men had gone 23 minutes without a score when Heavron finally ended the drought with a superb long range effort and they finished the half strongly with Bradley winning a free from which Heron did brilliantly to kick Derry’s fifth point from a free against the elements. That left two between the team with the clock already into injury time but there was still time for Galway’s first score from play on 36 minutes as Gareth Bradshaw ensured the half ended 0-8 to 0-5. Derry lost their captain and talisman, Mark Lynch, to injury for the second half with Emmett McGuckin coming in to replace him as conditions continued to give both teams trouble. Derry eventually claimed the first score of the second half through another excellent Heavron effort and which arrived six minute in but the second wasn’t long behind as O’Boyle worked a quick ‘one-two’ with Sean Leo McGoldrick before bring it back to a one point game at 0-8 to 0-7. Another ridiculously soft free won by Cummins allowed Sice to score his sixth free of the game on 48 minutes and seconds later Gary O’Donnell had restored Galway’s three point advantage. Sice’s seventh free put the home side into a four point lead before the 60 seconds which changed the complexion of the game entirely and at seven points up Galway never looked like letting the lead slip.